The next day was soft play day. 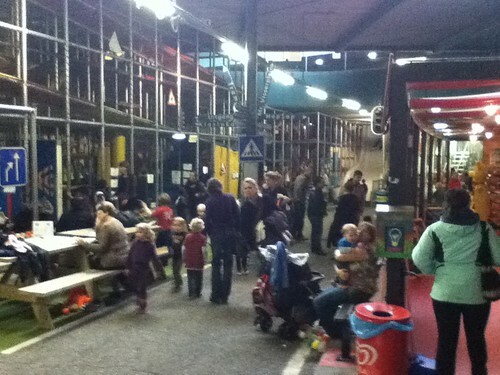 We headed out to Tun Fun, a massive soft play facility that has been built in a disused underpass, below a roundabout just next to Waterlooplein. We had a slightly odd experience as we went in, since we were stopped for Item to have her picture taken for a trade magazine - they were collecting 'fashions in children's wear' for a magazine that goes to kids' boutique owners, so it's nice to think she's a trend-setter. It's the small child equivalent of being stopped for Grazia magazine's street style feature. Maybe. Tun Fun presented us with our longest queuing experience of the entire holiday, and in a cold, damp tunnel to boot. By the time we got there, they were operating 'one in, one out' and we waited about an hour. 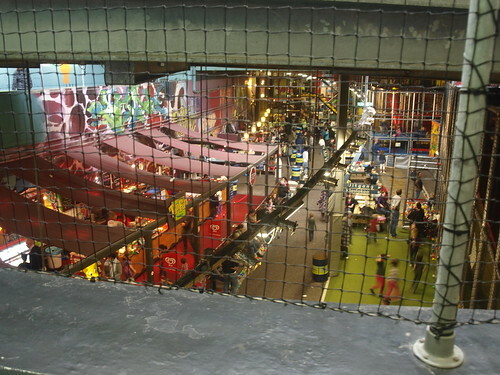 I don't know what we had expected, but inside it was manic: one couldn't help think of Lord of the Flies as kids raced at top speed up and down the central aisle, from trampoline to ball pool to giant Lego to skittles, with the dark half-light lending it all a hellish atmosphere. To be absolutely honest, it was a bit much for Item: maybe she could have held her own if kids had been speaking her own language, but when they were grabbing stuff from her *and* talking Dutch, she just got bewildered and upset. Not our greatest outing, and once a tiny little toddler had barged Item away from the skittle ball, and she (Item, this is) had burst into appalled tears that anyone could be so harsh, we thought it best that we leave. If it hadn't been half term, the experience might have been quite different. If we had been parents to a rumbunctious boy rather than our fragile wee girlie, no doubt he'd have been in his theoretical element. So don't let this put you off if either of those apply to you. We sought solace in Coffee Company, Amsterdam's answer to Starbucks and a partial response to my wondering whether the whole latte/mocha/cappuccino craze had actually bypassed the Netherlands (based on my experience that most cafes offered 'coffee' or 'cappuccino', with the former being instant and the latter being like a small, strong latte). 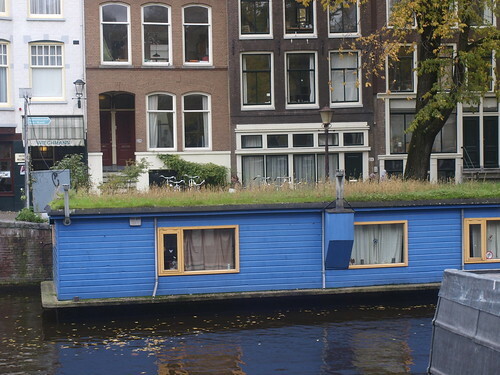 On the way home, we wandered briefly through the Nine streets (a block of canals and roads which supposedly yield many independent little shops) and admired other peoples' houseboats before returning to our own.